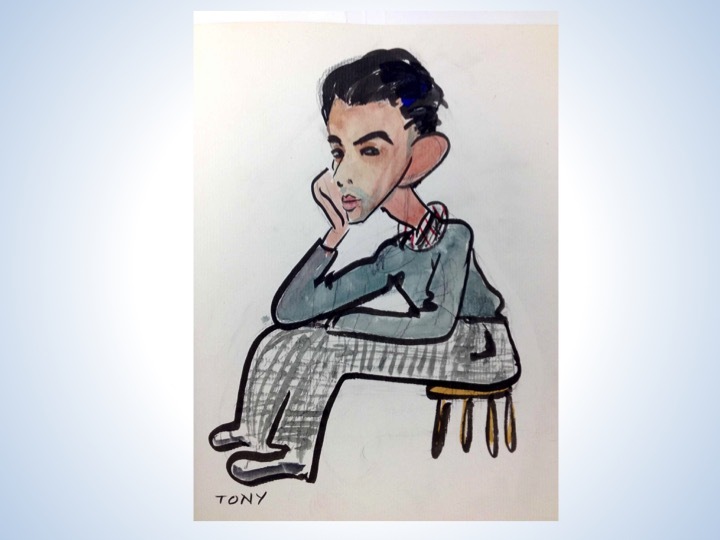 They paved paradise, the Ur post, part One . . .
Court of Pacifica, 1939, Gabriel Moulin photo. What mysterious force dragged me to Treasure Island that foggy day in [add month here], [198__ . . . I really don’t remember and probably will not fill in the blanks ever]? All I know is, I was curious about Treasure Island because I saw it every day on my commute across the Bay Bridge, Berkeley to San Francisco, and wondered what in the world. . . I knew it was a Navy base and hence inaccessible to me (I thought). I saw three pale, flat, interesting looking quasi-Deco or Moderne buildings along the southern perimeter, the side of the island that faces the bridge. One of them looked like a wedding cake; the other two looked like middle Eastern fortresses. Both were painted a pale yellowish-white. What caused those three unusual buildings to exist on the flat, otherwise dull-looking island? This was pre-internet, at least pre-internet for me, so anything I learned about it was from the library, the telephone, or gossip. So one Sunday I saw an “Events” notice in the Datebook section of the Sunday Chronicle: “Walking tour of Treasure Island. Sponsored by Art Deco Society of California.” The walk was on the following Saturday and I decided to go. First I had to get there, driving on the westbound Bay Bridge. I had never paid any attention to the signs on the bridge and assumed that the exit to Treasure Island would be on the north side of the bridge, since that is where the island is. But no–then, as now, the exit was on the south (left) side of the bridge. Ditto for the exit on the westbound bridge–all exits to Treasure Island come off of the left lane. Remember that when you drive to the island. Anyway, on my first trip to the island, I missed the exit. I got off the bridge at the first SF exit, turned around, and came back. I only missed a few minutes of the tour, which began with an introductory talk in the Treasure Island Museum by Douglas S. Brookes, then curator of the museum. 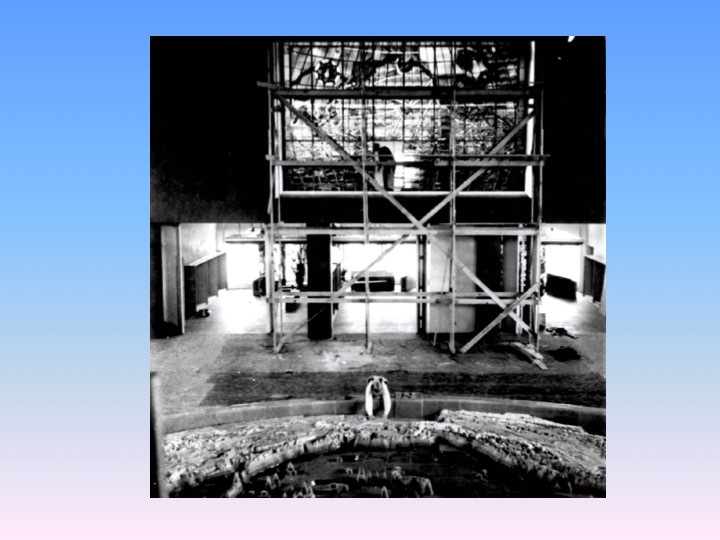 A very cordial, articulate and soft-spoken man, Doug gave us a brief tour of the museum itself, which at the time occupied the entire lobby of the first floor of Building One on Treasure Island–the hollow, streamlined wedding cake. Among the most impressive items on exhibit that day was a ’30s era AAA tow truck, painted gleaming yellow and blue, such as might have been used on the bridge during its early years. Then we walked down a flight of stairs to a screening room, where Doug showed us a slide presentation featuring color images from the Golden Gate International Exposition (GGIE) of 1939-1940. The presentation and Doug’s narrative gave us a brief history of the island from its creation in 1937-38, the fair, the (planned) airport, the Naval occupation beginning in 1940, through to the present time. 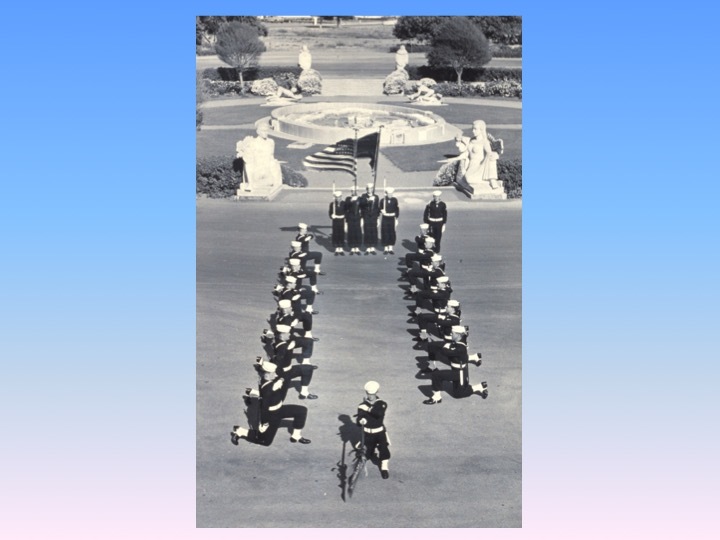 Although at that time the Navy had occupied the island for 48 years, it was obvious to me that by far the island’s most interesting–certainly the most beautiful–years occurred during its time as the site of the GGIE, California’s last world’s fair. Given my own personal history since that day, I guess I can say that few events in my life have had the impact of Doug’s presentation, or of our subsequent walk up to the location of the former Court of Pacifica. We left Building One–called the “Administration Building” during the years of the GGIE–via the back door, and began walking north along a corridor of buildings that cut through the middle of the island. 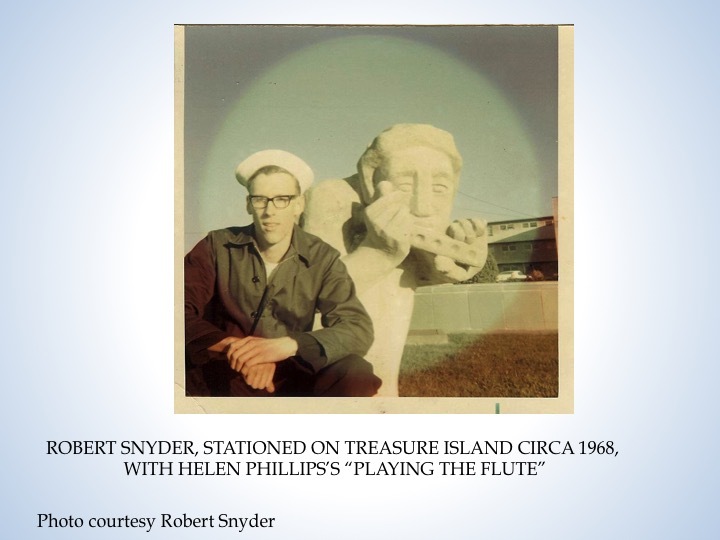 I remember that it was cool and a little blustery, and other than the old GGIE buildings and some landscaping, Naval Station Treasure Island struck me as grim and unkempt, unsuited to such an evocative and romantic name. I wasn’t sure what our destination would be. Reaching our destination was like coming upon a recently unearthed ruin in the midst of some kind of urban holocaust, as if something had erupted from underground after an earthquake. In the middle of a paved street, surrounded by ugly squat buildings and a few grim-looking, forlorn trees, was a wide plaza sunk about eight feet below grade. At the center of the plaza was a huge, brilliantly colored terra cotta thing (I really couldn’t tell what it was), oval, about three feet high, its horizontal dimensions approximately 20 x 35 feet, glazed in many shades of blue, green, yellow and white. The complex, three-dimensional surface of the oval formed a grid composed of individual tiles, no two of which were alike. 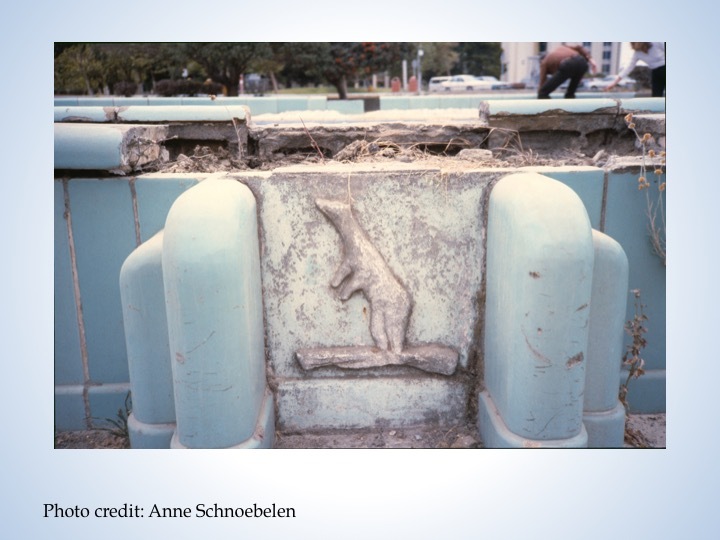 The big oval was enclosed in a retaining wall of solid blocks of aqua tiles, one of which was decorated with a white polar bear in high relief. This oval was surrounded by a lawn on which were eight large gray sculptures, representing people in active poses–kneeling, crouching, playing musical instruments, reclining. These sculptures were about two times life size. Four symmetrically-placed cement sets of stairs, about eight feet wide, led from grade down to the plaza. At the top of and flanking each set of stairs was a pair of monumental sculptures–perhaps three times life size. One set represented men astride seated llamas couchant, another showed a man and woman reclining on large stylized vines. What in the world were these things doing here? In the middle of Naval Station Treasure Island? 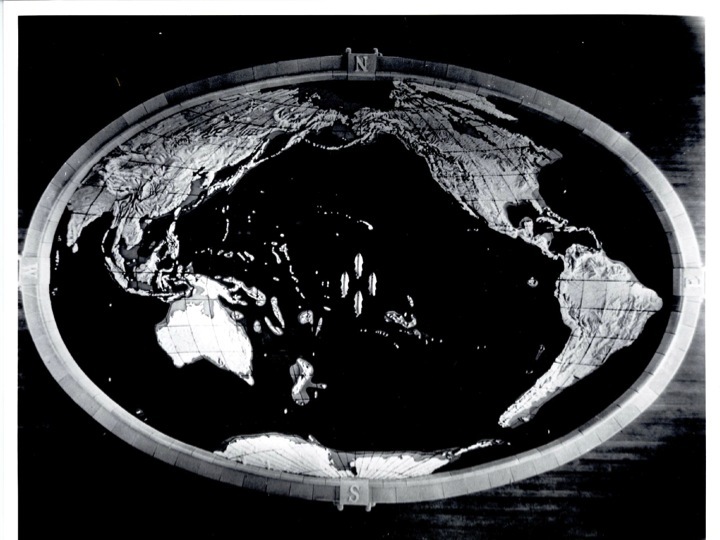 The big terra cotta thing, Doug told us, was a map of the Pacific Basin–a map in the form of a fountain, which in better years had had four spouting whales at its center. Now the whales were gone–stolen, probably–represented only by four rectangles filled with dirt. The map was in pretty terrible condition, with some of the large outer aqua tiles missing, some of them broken, many of the surface tiles chipped, with weeds growing in the dirt between the tiles. The statues too were in bad condition, some of the damage done by exposure to salt air, wind and water, some due to vandalism. 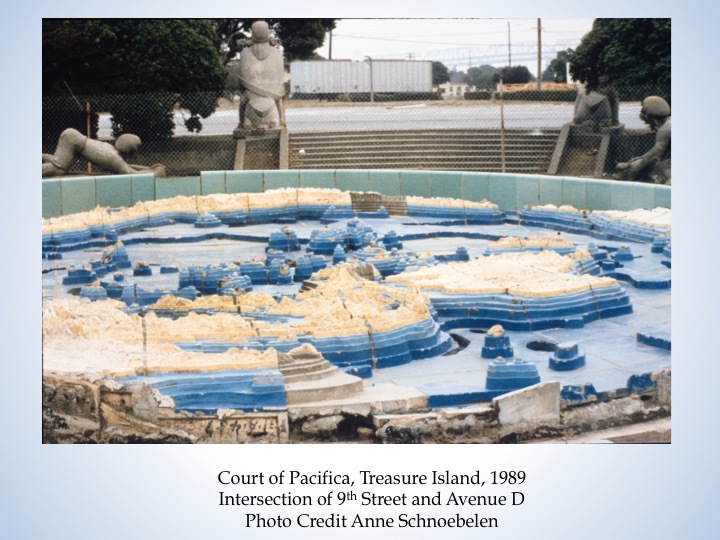 The map of the Pacific was from a building at the GGIE called “Pacific House.” The sculptures, plaza and stair were from the GGIE’s Court of Pacifica, which was located exactly where we were standing. This entry was posted in Uncategorized on October 9, 2014 by anneschnoe. (Outside of fence) Job Corps corridor, looking south from near 9th Street. This vista was formerly the Promenade of the Seven Seas–Tower of the Sun was at the end of this corridor. (Inside of fence) Job Corps corridor, looking south from near 9th Street, former “Promenade of the Seven Seas.” Tower of the Sun was at the end of this corridor. “Peacemakers” dimensional mural by Esther, Helen and Margaret Bruton, located on the west side of the Court of Pacifica, just above the “Northwest Passage” entrance to the GGIE. Fountain of Western Waters in foreground. 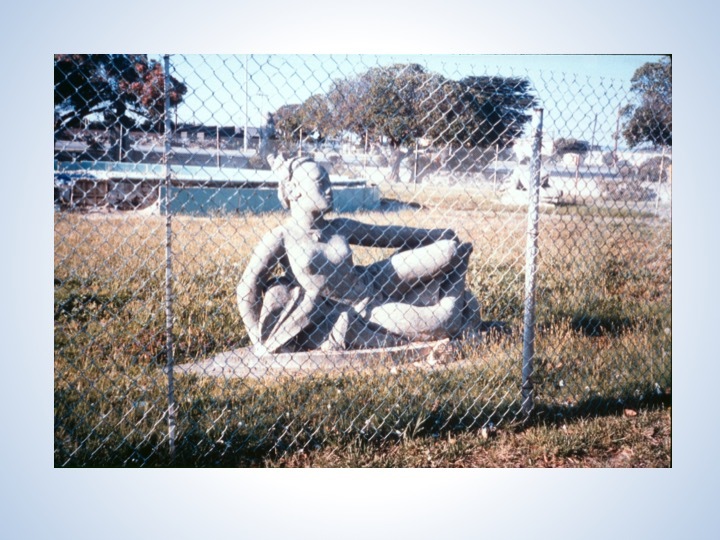 In this photo, statue of Pacifica would have been to the right (north), Tower of the Sun to the left (south). Look for a circular design on the left side of this map, a little above the middle, at the end of Avenue C–that is the original location of the Fountain of Western Waters (and later, the Pacific Basin Fountain). This location was originally the Court of Pacifica. The Navy built 9th Street right through the court, but (fortunately), designed the street to go around the fountain. This map of Naval Station Treasure island has been cropped to provide details of the area where the Court of Pacifica was located. Many many thanks to Bruce Gifford for this map! I first came to Treasure Island in . . . 1988 or 1989? Wish I could recapture the exact date but it seems to be long gone. It was a walking tour sponsored by the Art Deco Society of California. To make a long story short (I will tell the long version later), we met with the curator of the Treasure Island Museum, Douglas Brookes, who walked with us up a long north-west outdoor corridor which I now know to be Avenue C. I call it a “corridor” rather than a street because it was narrow and lined with buildings. All of the buildings were flat and square, yellowish or dun in color, fairly flat and dull. The place wasn’t sparkling and efficient looking, which is how I had always imagined Navy bases. It looked dull and depressing. 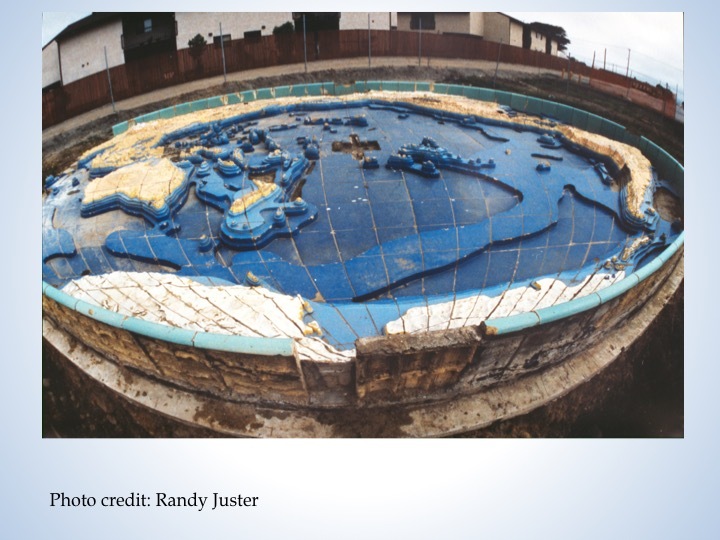 At the end of the long, narrow corridor was an amazing sight–a still-splendid (but somewhat dilapidated) terra cotta pool made of large tiles, representing a colorful, amazingly detailed, three dimensional oval map of the Pacific Basin. 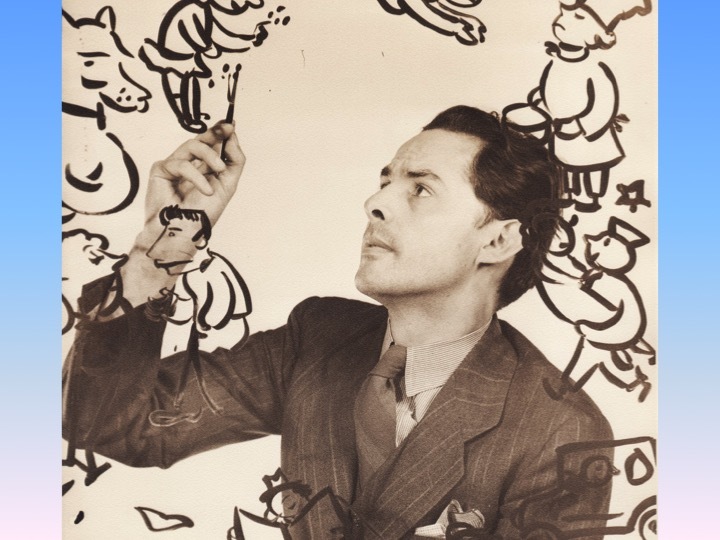 It was fairly recognizable for what it was, but we really needed Douglas to explain it to us. This map was contained by a wall of glazed tiles the color of a swimming pool. Very pretty! 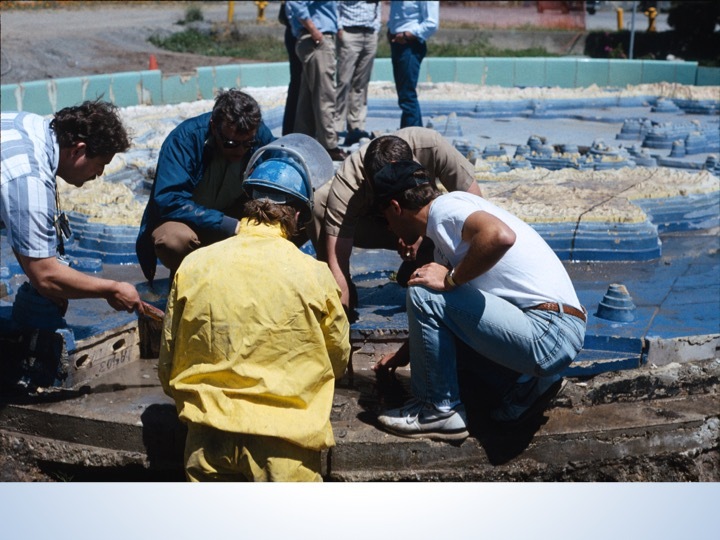 The pool was on a sunken plaza, about eight feet below grade, surrounded by a weedy lawn. Surrounding the pool were eight sculptures, about twice life-size, of people engaged in various activities–playing musical instruments, lounging on a beach, grinding corn, ice-fishing. In four symmetrical locations around the plaza were sets of stairs, about eight stairs each, eight feet wide. At the top of the stairs and flanking each set of stairs at grade level were four pairs sculptures. 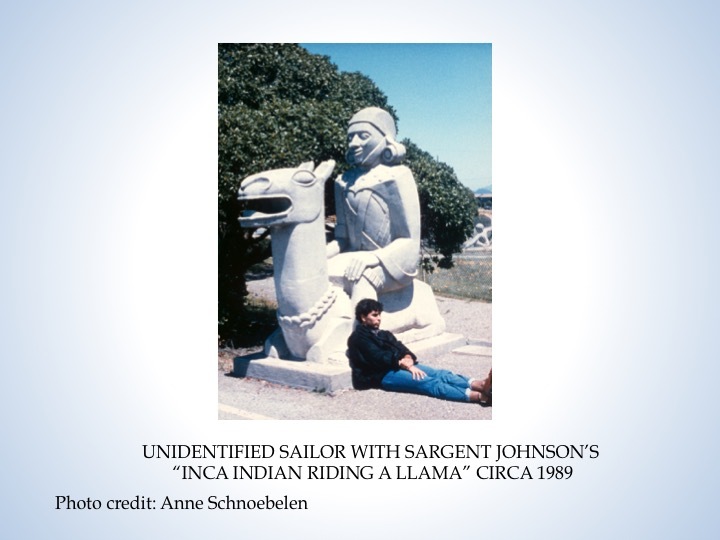 These sculptures were larger and represented people in more static poses–sitting on a llama, kneeling, reclining. 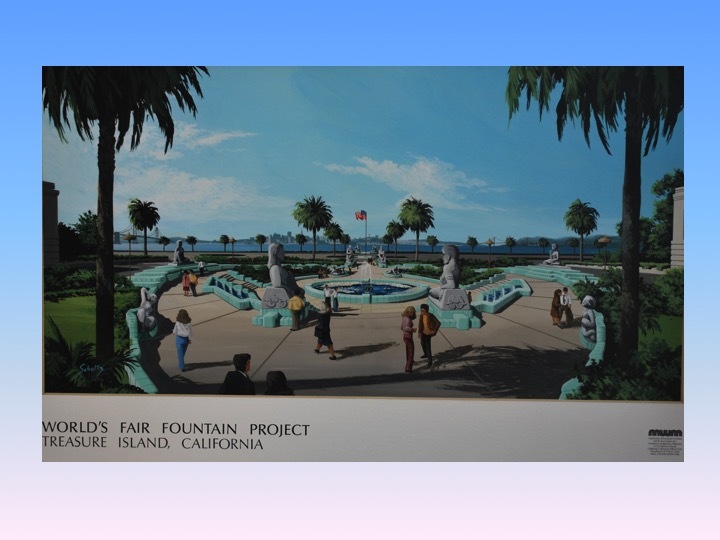 Douglas explained to us that these figures, which were made of cast stone, an arty euphemism for cement, represented peoples of the Pacific Basin, and that the fountain was the Fountain of the Pacific by an artist named Antonio Sotomayor. 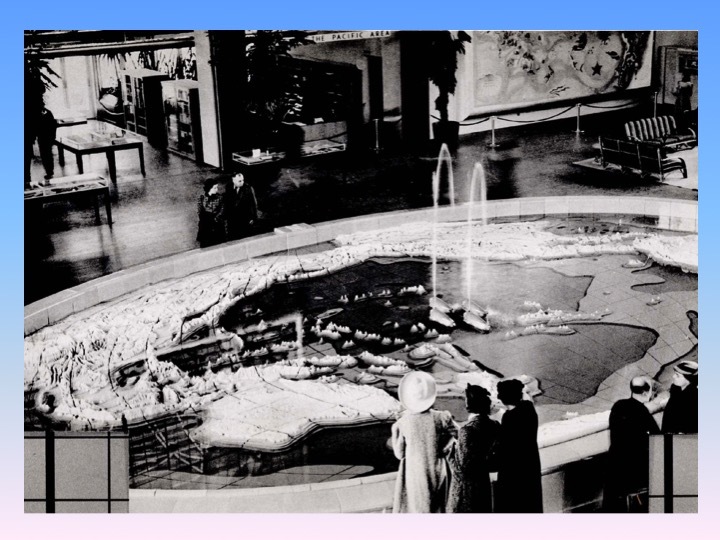 These amazing pieces were the remains of the Court of Pacifica at the Golden Gate International Exposition of 1939-1940.
that the Navy wanted to pave. The street curved around the fountain. The Navy wanted to straighten out the street. On the map (last image in the gallery) find 9th Street and Avenue C, and you’ll see a circular design in the middle of 9th Street. That is what the Navy wanted to pave. I will show pictures of the fountain and statues in a later post. Right now I just want to show you some images of what the Court of Pacifica looked like in 1939-1940, and what it looks like now. I have three sets of “then and now” images. The “now” images could be better and I will replace them soon. But I think you will get the idea. Currently, the Court of Pacifica is a parking lot, part of 9th Street, and a bit of a couple of residences. 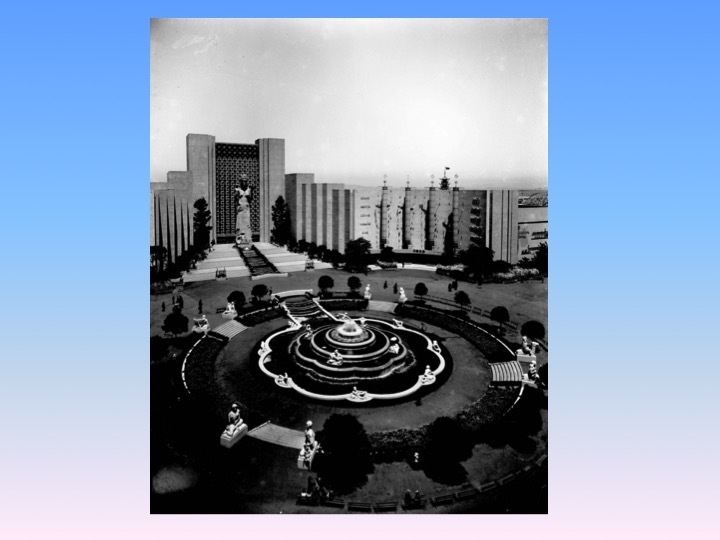 I have two images of the Court of Pacifica looking south–showing the original fountain from the court, which was called the Fountain of Western Waters (it was removed by the Navy and replaced by the Pacific Basin Fountain–more on that later). 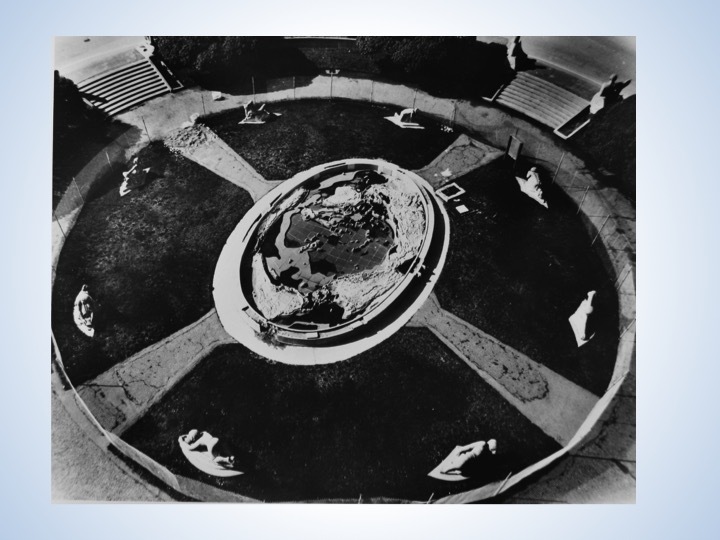 The original fountain was four round/scalloped graduated tiers, with water flowing from the top tier to the bottom. Four sculptures were located on the top tier of the fountain, and eight were located on the bottom tier. Both images show the Tower of the Sun. At the location of the Tower of the Sun now is a small shack at the southern entrance to the Job Corps, quite sad really (as what part of this story isn’t–but somehow the shack just gets me). The shack is where the guard sits to keep people from trespassing on the Job Corps property. But we can’t see the shack because so much foliage has grown up along the corridor (which is nice really), and anyway, it is only about ten feet high . . . whereas the Tower of the Sun was 410 feet. How do we know exactly where the Tower of the Sun was? It is one of few unmovable markers by which we can measure where things were at the fair. 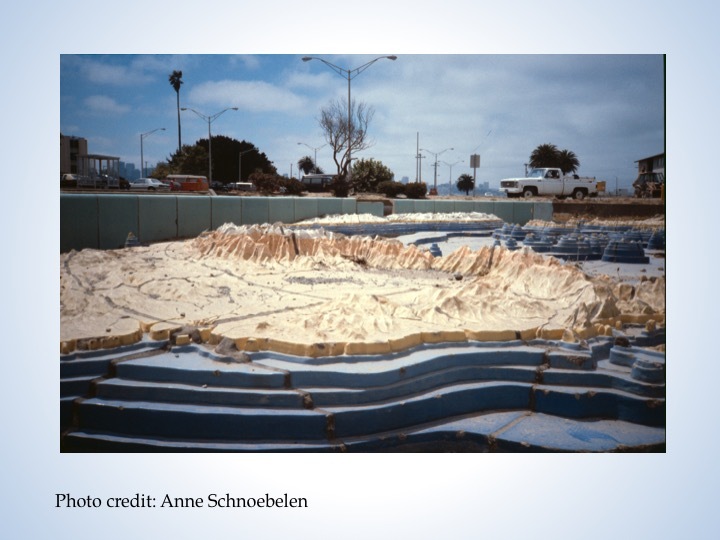 Treasure Island liquifacted to varying depths during the Loma Prieta Earthquake, and the foundations of the Tower of the Sun materialized for the first time since it was torn down. I was able to get over there before the Navy removed the foundations and took enough pictures to be able to locate it in the future. There are also a couple of spots on the asphalt where you can see an angle of the Tower’s octagon. So we do know precisely where the Tower of the Sun was. Also in the gallery is a photo looking west in the Court of Pacifica. During the years of the fair, the western wall of the Court was also the northwest entrance/exit of the fair, called “The Northwest Passage.” Guests entered the fair right under the wonderful “Peacemakers” mural by the Bruton sisters–Esther, Margaret and Helen. Now, if you look west from the formelocation of the court of Pacifica, you see alight standards, the Bay, and the Golden Gate Bridge. This entry was posted in Uncategorized on September 30, 2014 by anneschnoe. Thanks for reading this blog! 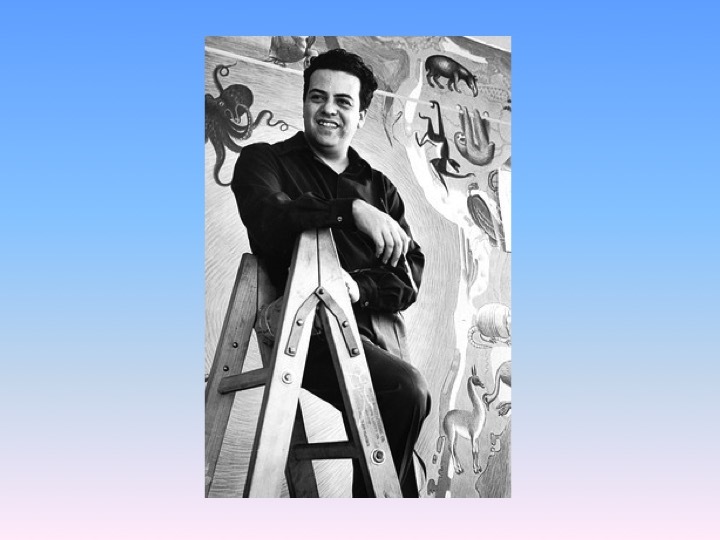 I am setting it up in order to begin recording my research, presentations, and photography relating to Treasure Island and the Golden Gate International Exposition of 1939-1940 (GGIE). I’ve chosen the “then and now” title because for years I have been taking photos of contemporary Treasure Island and matching them with collected photos from the years of the exposition, and using those photos during walking tours and slide lectures. Fortunately a few beautiful buildings still remain from the years of the fair, although all of the spectacular “Expo Deco” buildings are gone. Please check back here for updates! (I’m just getting started putting years of research online) and thanks for your interest! This entry was posted in Uncategorized on August 9, 2014 by anneschnoe.